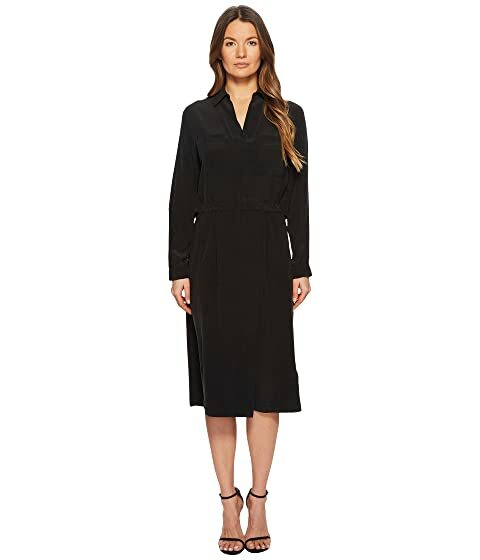 Conduct your day's business in style wearing the Vince® Slit Back Shirtdress. Long sleeves with tie cuffs. We can't currently find any similar items for the Slit Back Shirtdress by Vince. Sorry! Overall: Rated: 3 stars! Comfort: Rated:3 stars! Style: Rated:2 stars! I felt the sizing was correct. I did not give this dress a fair chance. It was extremely wrinkled and the fabric was very clingy out of the box. I would have had to steam it extensively to see how it is supposed to drape. I was disappointed that the dress did not have a lining that could help the wearer combat static if it arose. I felt I would have had to spend considerably on appropriate undergarments to allow the dress to drape properly for all day wear.